Many people are aware that eating too much salt is bad for their health, but think that it’s only a cause for concern in our later years. This isn’t true, as eating too much salt during childhood increases blood pressure which then tracks into adulthood and later life, increasing the risk of strokes and heart attacks. That’s why it’s so important to reduce salt intake across all ages. By doing so we can reduce our risk of heart disease and avoid the unnecessary and extortionate healthcare costs associated with treatment. 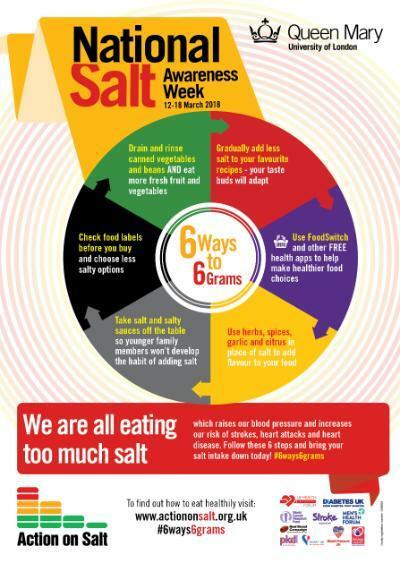 Over the course of the week we reminded people about the harmful effects of eating too much salt and highlighted how the salt present in everyday foods can really add up. In the UK we currently eat more salt than is recommended, and a big part of that is due to the high amounts hidden in the food we buy. That’s why we are calling for more action from the food industry and out of home sector to reduce the amount they add, and to provide us with healthier choices lower in salt. We also encourage the public to play their part and make simple changes to their eating and purchasing habits. Through this collaborative effort we are sure to improve the nation’s diet, and in doing so save many more lives and millions of pounds in health care costs. During the week we also hosted a Parliamentary Reception at the House of Commons to discuss the future of salt reduction in the UK, with attendees from the Department of Health, NGOs and the food industry.